Quoted from Samuel Janney's Life of William Penn, 6th edition, 1882. In the spring of 1683, William Penn made a journey to the interior of his province, during which he made himself more fully acquainted with its surface, soil, and natural productions and visited the Indians in their wigwams, with whom he learned to converse in their own language. The result of his observations is communicated in the following interesting letter to the Free Society of Traders. MY KIND FRIENDS: — The kindness of yours by the ship Thomas and Ann does much oblige me; for by it I perceive the interest you take in my health and reputation, and in the prosperous beginning of this province, which you are so kind as to think may much depend upon them. In return of which I have sent you a long letter, and yet containing as brief an account of myself and the affairs of this province as I have been able to make. In the first place, I take notice of the news you sent me, whereby I find some persons have had so little wit, and so much malice, as to report my death; and, to mend the matter, dead a Jesuit too. One might have reasonably hoped that this distance, like death, would have been a protection against spite and envy; and indeed absence, being a kind of death ought alike to secure the name of the absent as of the dead, because they are equally unable as such to defend themselves; but they who intend mischief do not use to follow good rules to effect it. However, to the great sorrow and shame of the inventors, I am still alive and no Jesuit; and, I thank God, very well. And without injustice to the authors of this, I may venture to infer, that they who wilfully and falsely report would have been glad had it been so. But I perceive many frivolous and idle stories have been invented since my departure from England, which perhaps at this time are no more alive than I am dead. But if I have been unkindly used by some I left behind me, I found love and respect enough where I came; an universal kind welcome, every sort in their way. For here are some several nations, as well as divers judgments: nor were the natives wanting in this; for their kings, queens, and great men, both visited and presented me, to whom I made suitable returns. 1. The country itself, its soil, air water, seasons, and produce, both natural and artificial, are not to be despised. The land containeth divers sorts of earth, as sand, yellow and black, poor and rich; also gravel, both loamy and dusty; and in some places a fast, fat earth, like that of our best vales in England, especially by inland brooks and rivers: God in his wisdom having ordered it so, that the advantages of the country are divided; the back lands being generally three to one richer than those that lie by navigable rivers. We have much of another soil, and that is a black hazel mould upon a stony or rocky bottom. 2. The air is sweet and clear, and the heavens serene, like the south parts of France, rarely overcast; and as the woods come by numbers of people to be more cleared, that itself will refine. 3. The waters are generally good; for the rivers and brooks have mostly gravel and stony bottoms, and in numbers hardly credible. We have also mineral waters, which operate in the same manner with those of Barnet and North Hall, not two miles from Philadelphia. 4. For the seasons of the year, having by God's goodness now lived over the coldest and hottest that the oldest liver in the province can remember, I can say something to and English understanding. First of the fall, for then I came in. I found it from the twenty-fourth of October to the beginning of December, as we have it usually in England in September, or rather like and English mild spring. From December to the beginning of March, we had sharp, frosty weather; not foul, thick, black weather, as our north-east winds bring with them in England, but a sky as clear as in the summer, and the air dry, cold, piercing, and hungry; yet I remember not that I wore more clothes than in England. The reason of this cold is given from the great lakes, which are fed by the fountains of Canada. The winter before was as mild, scarce any ice at all, while this for a few days froze up our great river Delaware. From that month to the month called June, we enjoyed a sweet spring; no gusts, but gentle showers and a fine sky. Yet this I observe, that the winds here, as there, are more inconstant, spring and fall, upon that turn of nature, than in summer or winter. From thence to this present month, August, which endeth the summer, commonly speaking, we have had extraordinary heats, yet mitigated sometimes by cool breezes. The wind that ruleth the summer season is the south-west; but spring, fall, and winter, it is rare to want the north-western seven days together. And whatever mists, fogs, or vapours foul the heavens by easterly or southerly winds, in two hours time are blown away; the one is followed by the other; a remedy that seems to have a peculiar providence in it to the inhabitants, the multitude of trees yet standing being liable to retain mists and vapours, and yet not one quarter so thick as I expected. 5. The natural produce of the country, of vegetables, is trees, fruits, plants, flowers. The trees of most note are the black walnut, cedar, cypress, chestnut, poplar, gum-wood, hickory, sassafras, ash, beech, and oak of divers sort, as red, white and black; Spanish chestnut, and swamp, the most durable of all; of all which there is plenty for the use of man. The fruits I find in the woods are the white and black mulberry, chestnut, walnut, plums, strawberries, cranberries, hurtleberries, and grapes of divers sorts. The great red grape, now ripe, called by ignorance the fox-grape, because of the relish it hath with unskilful palates, is in itself an extraordinary grape; and by art, doubtless, may be cultivated to an excellent wine, if not so sweet, yet little inferior to the Frontiniac, as it is not much unlike it in taste, ruddiness set aside; which. in such things, as well as mankind, differs the case much. There is a white kind of muscadel, and a little black grape, like the cluster grape of England, not yet so ripe as the other; but, they tell me, when ripe, sweeter, and that they only want skilful vinerons to make good use of them. I intend to venture on it with my Frenchman this season, who shows some knowledge in those things. Here are also peaches very good, and in great quantities, not an Indian plantation without them; but whether naturally here at first I know not. However, one may have them by bushels for little. They make a pleasant drink, and I think not inferior to any peach you have in England, except the true Newington. It is disputable with me, whether it be best to fall to fining the fruits of the country, especially the grape, by the care and skill of art, or send for foreign stems and sets already good and approved. It seems most reasonable to believe, that not only a thing groweth best where it naturally grows, but will hardly be equalled by another species of the same kind, that doth not naturally grow there. But to solve that doubt, I intend, if God give me life, to try both, and hope the consequence will be as good wine as any European countries of the same latitude do yield. 6. The artificial produce of the country is wheat, barley, oats, rye, peas, beans, squashes, pumkins, water melons, musk-melons, and all herbs and roots that our gardens in England usually bring forth. 7. Of living creatures, fish, fowl, and the beasts of the wood, here are divers sorts, some for food and profit, and some for profit only: for food as well as profit, the elk, as big as a small ox, deer, bigger than ours; beaver, raccoon, rabbits, squirrels; and some eat young bear and commend it. Of fowl of the land there is the turkey, (forty and fifty pounds weight) which is very great, pheasants, heath-birds, pigeons, and partridges in abundance. Of the water, the swan, goose, (white and gray;) brands, ducks, teal, also the snipe and curloe, and that in great numbers, but the duck and teal excel, nor so good have I ever eaten in other countries. Of fish there is the sturgeon, herring, rock, shad, cat's-head, sheep's-head, eel, smelt, perch, roach; and in inland rivers trout, some say salmon above the Falls. Of shell-fish, we have oysters, crabs, cockles, conchs, and msucles; some oysters six inches long, and one sort of cockles as big as the stewing oysters: they make a rich broth. The creatures for profit only, by skin or fur, and which are natural to these parts, are the wild cat, panther, otter, wolf, fox, fisher, minx, musk-rat; and of the water, the whale for oil, of which we have a good store; and two companies of whalers, whose boats are built, will soon begin their work, which hath the appearance of considerable improvement; to say nothing of our reasonable hopes of good cod in the bay. 8. We have no want of horses, and some are very good and shapely enough. Two ships have been freighted to Barbadoes, with horses and pipe-staves, since my coming in. Here is also plenty of cow-cattle and some sheep. The people plough mostly with oxen. 9. There are divers plants, which not only the Indians tell us, but we have had occasion to prove, by swellings, burnings, and cuts, that they are of great virtue, suddenly curing the patient; and for smell, I have observed several, especially one, the wild myrtle, the other I know not what to call, but they are most fragrant. 10. The woods are adorned with lovely flowers for colour, greatness, figure, and variety. I have seen the gardens of London best stored with that sort of beauty, but think they may be improved by our woods. I have sent a few to a person of quality this year for a trial. Thus much of the country: next, of the natives or aborigines..
11. The natives I shall consider in their person, language, manners, religion, and government, with my sense of their original. For their persons, they are generally tall, straight, well built, and of singular proportion; they tread strong and clever, and mostly walk with a lofty chin. Of complexion black, but by design, as the gipsies in England. They grease themselves with bear's fat clarified; and using no defence against sun and wather, their skins must needs be swarthy. Their ey is little and black, not unlike a straight-looked Jew. The thick lip and flat nose, so frequent with the East Indians and black, are not common to them; for I have seen as comely European-like faces among them, of both sexes, as on your side the sea; and truly an Italian complexion hath not much more of the white; and the noses of several of them have as much of the Roman. 13. Of their customs and manners there is much to be said. I will begin with the children. So soon as they are born they wash them in water, and while very young, and in cold weather to choose, they plunge them in the rivers to harden and embolden them. Having wrapt them in a clout, they laid them on a straight board a little more than the length and breadth of the child, and swaddle it fast upon the board to make it straight; wherefore all Indians have flat heads; and thus they carry them at their backs. The children will go very young, at nine months commonly. They wear only a small clout round their waist till they are big. If boys, they go a-fishing till ripe for the woods, which is about fifteen. Then they hunt; and, having given some proofs of their manhood by a good return of skins, they may marry; else it is a shame to think of a wife. The girls stay with their mothers, and help to hoe the ground, plant corn, and carry burthens; and they do well to use them to that, while young, which they must do when they are old; for the wives are the true servants of the husbands: otherwise the men are very affectionate to them. 14. When the young women are fit for marriage, they wear something upon their heads for an advertisement, but so as their faces are hardly to be seen but when they please. The age they marry at, if women, is about thirteen or fourteen; if men, seventeen or eighteen. They are rarely older. 15. Their houses are mats or barks of trees, set on poles in the fashion of an English barn, but out of the power of the winds, for they are hardly higher than a man. They lie on reeds or grass. In travel they lodge in the woods about a great fire, with the mantle of duffils they war by day wrapt about them, and a few boughs stuck round them. 16. Their diet is maize or Indian corn divers ways prepared, sometimes roasted in the ashes, sometimes beaten and boiled with water, which they call homine. They also make cakes not unpleasant to eat. They have likewise several sorts of beans and peas that are good nourishment and the woods and rivers are their larder. 17. If any European comes to see them, or calls for lodgings at their home or wigwam, they give him the best place and first cut. If they come to visit us, they salute us with an Itah, which is as much as to say, 'Good be to you!' and set them down, which is mostly on the ground, close to their heels, their legs upright: it may be they speak not a word, but observe all passages. If you give them any thing to eat or drink, wellfor they will not ask; and, be it little or much, if it be with kindness they will be pleased: else they will go away sullen, but say nothing. 18. They are great concealers of their own resentments, brought to it, I believe, by the revenge that hath been practiced among them. In either of these they are not exceeded by the Italians. A tragical instance fell out since I came into the country. A king's daughter, thinking herself slighted by her husband in suffering another woman to lie down between them, rose up, went out, plucked a root out of the ground, and ate it, upon which she immediately died; and for which, last week, he made an offering to her kindred for atonement and liberty of marriage, as two others did to the kindred of their wives who died a natural death: for till widowers have done so, they must not marry again. Some of the young women are said to take undue liberty before marriage for a portion; but when married, chaste. 19. But in liberality they excel. Nothing is too good for their friend. Give them a fine gun, coat, or other thing, it may pass twenty hands before it sticks: light of heart, strong affections, but soon spent: the most merry creatures that live: they feast and dance perpetually: they never have much, nor want much. Wealth circulateth like the blood. All parts partake; and though none shall want what another hath, yet excct observers of property. Some kings have sold, others presented me with several parcels of land. The pay or presents I made them were not hoarded by the particular owners; but the neighboring kings and their clans being present when the goods were brought out, the parties chiefly concerned consulted what, and to whom they should give them. To every king, then, by the hands of a person for that work appointed, is a proprtion sent, so sorted and folded, and with that gravity which is admirable. Then that king subdivided it in like manner among his dependants, they hardly leaving themselves an equal share with one of their subjects; and be it on such occasions as festivals, or at their common meals, the kings distribute, and to themselves last. They care for little, because they want but little: and the reason is, a little contents them. In this they are sufficiently revenged on us. If they are ignorant of our pleasures, they are free of our pains. They are not disquieted wilth bills of lading and exchange, nor perplexed with chancery suits and exchequer reckonings. We sweat and toil to live. Their pleasure feeds them; I mean their hunting, fishing, and fowling, and this table is spread everywhere. They eat twice a day, morning and evening. Their seats and table are the ground. Since the Europeans came into these parts, they are grown great lovers of strong liquors, rum especially; and for it exchange the richest of their skins and furs. If they are heated with liquor, they are restless till they have enought to sleep. That is their cry, 'Some more, and I will go to sleep;' but, when drunk, one of the most wretched spectacles in the world. 20. In sickness, impatient to be cured, and for it give any thing, especially for their children, to whom they are extremely natural. They drink at those times a teran, or decoction of some roots in spring water; and if they eat any flesh, it must be of the female of any creature. If they die, they bury them with their apparel, be they man or woman, and the nearest of kin fling in something precious with them, as a token of their love; their mourning is blacking of their faces, which they continue for a year. They are choice of the graves of their dead: lest they should be lost by time, and fall to common use, they pick off the grass that grows upon them, and heap up the fallen earth with great care and exactness. 21. These poor people are under a dark night in things relating to religion, to be sure the tradition of it: yet they say there is a great King, that made them, who dwells in a glorious country to the southward of them; and that the souls of the good shall go thither, where they shall live again. Their worship consists of two parts, sacrifice and cantico. Their sacrifice is their first fruits. The first and fattest buck they kill goeth to the fire, where he is all burnt, with a mounful ditty of him who performeth the ceremony, but with such marvellous fervency and labour of body, that he will even sweat to a foam. The other part is their cantico, performed by round dnaces, sometimes words, sometimes songs, then shouts; two being in the middle who begin, and by singing and drumming on a board, direct the chorus. Their postures in the dance are very antic and differing, but all keep measure. This is done with equal earnestness and labour, but great appearance of joy. In the fall, when the corn cometh in, they begin to feast one another. There have been two great festivals already, to which come all that will. I was at one myself. Their entertainment was a great seat by a spring under some shady trees, and twenty bucks, with hot cakes of new corn, both wheat and beansw, which they make up in a square form, in the leaves of the stem, and bake them i the ashes, ad after that they fall to dance. But they who go must carry a small present in their money; it may be sixpence, which is made of the bone of a fish; the black is with them as gold; the white silver; they call it wampum. 22. The government is by kings, which they call sachama, and those by succession; but always on the mother's side. For instance, the children of him who is now king will not succeed, but his brother by the mother, or the children of his sister, whose sons (and after them the children of her daughters) will reign, for no woman inherits. The reason they render for this way of descent is, that their issue may not be spurious. 23. Every king has his council; and that consists of all the old and wise men of his nation, which perhaps is two hundred people. Nothing of moment is undertaken, be it war, peace, selling of land, or traffic, without advising with them, and, which is more, with the young men too. It is admirable to consider how powerful the kings are, and yet how they move by the breath of their people. 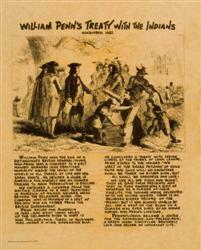 I have had occasion to be in council with them upon treaties for land, and to adjust the terms of trade. Their council, the old and wise, on each hand. Behind them, or at a little distance, sit the younger fry in the same figure. Having consulted and resolved their business, the king ordered one of them to speak to me. He stood up, came to me, and in the name of the king saluted me, then took me by the hand, and told me that he was ordered by his king to speak to me, and that now it was not he but the king who spoke, because what he should say was the king's mind. He first prayed me excuse them, that they had not complied with me the last time. He feared there might be some fault in the interpreter, being neither Indian nor English. Besides it was the Indian custom to deliberate and take up much time in council before they resolved; and that, if the young people and owners of the land had been as ready as he, I had not met with so much delay. Haqving thus introduced his matter, he fell to the bounds of the land they had agreed to dispose of, and the price; which now is little and dear, that which would have bought twenty miles not buying now two. During the time that this person spoke, not a man of them was observed to whisper or smile — the old grave, the young reverent in their deportment. They speak little, but fervently, and with elegance. I have never seen more natureal sagacity, considering them without the help (I was going to say the spoil) of tradition: and he will deserve the name of wise who outwits them in any treaty about a thing they understand. When the purchase was agreed, great promises passed between us of kindness and good neighbourhood, and that which done, another made a speech to the Indians, in the name of all the sachamkers or kings; first, to tell them what was done; next, to charge and command them to love the CHristians, and particularly to live in peace with me and the people under my government; that many governors had been in the river; but that no governor had come himself to live and stay here before: and having now such an one, who had treated them well. they should never do him or his any wrong; at every sentence of which they shouted, and said Amen in their way. 25. We have agreed, that in all differences between us, six of each side shall end the matter. Do not abuse them, but let them have justice, and you win them. The worst is, that they are the worse for the Christians, who have propagated their vices, and yielded them tradition for ill and not for good things. But as low an ebb as these people are at, and as inglorious as their own condition looks, the Christians have not outlived their sight with all their pretensions to an higher manisfestation. What good then might not a good people graft, where there is so distinct a knowledge left between good and evil? I beseech God to incline the hearts of all that come into these parts to outlive the knowledge of the natives by a fixt obedience to their greater knowledge of the will of God; for it were miserable indeed for us to fall under the just censure of the poor Indian conscience, while we make profession of things so far transcending. 26. For their original, I am ready to believe them of the Jewish race, I mean of the stock of the ten tribes, and that for the following reasons: first, they were to go to a land not planted nor known, which to be sure Asia and Africa were, if not Europe; and He who intended that extraordinary judgement upon them might make the passage not uneasy to them, as it is not impossible in itself, from the easternmost parts of Asia to the westernmost of America. In the next place, I find them of the like countenance, and their children of so lively resemblance, that a man would think himself in Duke's Place or Berry Street in London, when he seeth them. But this is not all: they agree in rites; they reckon by moons; they offer their first fruits; they have a kind of feast of tabernacles; they are said to lay their altar upon twelve stones; their mourning a year; customs of women; with many other things tat do not now occur. So much for the natives. Next, the old planters will be considered in this relation, before I come to our colony and the concerns of it. 27. The first planters in these parts were Dutch, and soon after them the Swedes and Finns. The Dutch applied themselves to traffic, the Swedes and Finns to husbandry. There were some disputes between them for some years; the Dutch looking upon them as intruders upon their purchase and possession, which was finally ended in the surrender made by John Rizeing, the Swedish governor, to Peter Stuyvesant, governor for the States of Holland, anno 1655. 28. The Dutch inhabit mostly those parts of the province that lie upon or near the bay, and the Swedes the freshes of the river Delaware. There is no need of giving any description of them, who are better known there than here: but they are a plain, strong, industrious people, yet have made no great progress in culture, or propagation of fruit-trees; as if they desired rather to have enough than plenty or traffic. But I presume the Indians made them the more careless by furnishing them with the means to profit, to wit, skins and furs for rum and such strong liquors. They kindly received me as well as the English, who were few before the people concerned with me came among them. I must needs commend their respect to authority, and kind behaviour to the English. They do not degenerate from the old friendship between both kingdoms. As they are people proper and strong of body, so they have fine children, and almost every house full: rare to find one of them without three or four boys and as many girls; some six, seven and eight sons. And I must do them that right, I see few young men more sober and laborious. 29. The Dutch have a meeting-place for riligious worship at Newcastle; and the Swedes three; One at Christina, one at Tenecum, and one at Wicoco, within half a mile of this town. 30. The rests that I speak of the condition we are in, and what settlement we have made; in which I will be as short as I can; for I fear, and not without reason, that I have tried your patience with this long story. The country lieth bounded on the east by the river and bay of Delaware and Eastern Sea. It hath the advantage of many creeks, or rivers rather, that run into the main river or bay, some navigable for great ships, some for small craft. Those of most eminency are Christina, Brandywine, Skilpot, and Sculkil, any one of which has room to lay up the royal navy of England, there being from four to eight fathom water. 31. The lesser creeks or rivers, yet convenient for sloops and ketches of good burthen, are Lewis, Mespillion, Cedar, Dover, Cranbrook, Feversham, and Georges below; and Chichester, Chester, Toacawny, Pammapecka, Portquessin, Neshimenck, and Pennberry in the freshes: many lesser, that admit boats and shallops. Our people are mostly settled upon the upper rivers, which are pleasant and sweet, and generally bounded with good land. The planted part of the province and territories is cast into six counties: Philadelphia, Buckingham, Chester, Newcastle, Kent and Sussex, containing about four thousand souls. Two general assemblies have been held, and with such concord and despatch that they sat but three weeks, and at least seventy laws were passed without one dissent in any material thing. But of this more hereafter, being yet raw and new in our gear. However, I cannot forget their singular respect to me in this infancy of things, who, by their own private expenses, so early considered ine for the public, as to present me with an impost upon certain goods imported and exported, which, after my acknowledgement of their affection, I did as freely remit to the province and the traders to it. And for the well-government of the said counties, courts of justice are established in every county, with proper officers, as justices, sheriffs, clerks, constables; which courts are held every two months. But, to prevent lawsuits, there are three peacemakers chosen by every county court, in the nature of common arbitrators, to hear and end differences between man and man. And spring and fall there is an orphans' court in each county, to inspect and regulate the affairs of orphans and widows. 32. Philadelphia: the expectation of those who are concerned in this province is at last laid out, to the great content of those here who are any way interested theirin. The situation is a neck of land, and lieth between two navigable rivers, Delaware and Sculkill, whereby it hath two fronts upon the water, each a mile, and two from river to river. Delaware is a glorious river; but the Sculkill, being an hundred miles boatable above the falls, and its course north-east toward the fountain of Susquehannah, (that tends to the heart of the province, and both sides our own,) it is like to be a great part of the settlement of this age. I say little of the town itself, because a platform will be shown you by my agent, in which those who are purchasers of me, will find their names and interests. But this I will say, for the good providence of God, that of all the many places I have seen in the world, I remember not one better seated; so that it seems to me to have been appointed for a town, whether we regard the rivers, or the conveniency of the coves, docks, and springs, the loftiness and soundness of the land, and the air, held by the people of those parts to be very good. It is advanced within less than a year, to about fourscore houses and cottages, such as they are, where merchants and handicrafts are following their vocations as fast as they can; while the countrymen are close at their farms. Some of them got a little winter corn in the ground last season; and the generality have had a handsome summer-crop, and are preparing for their winter corn. They reaped their barley this year, in the month called May, the wheat in the month following; so that there is time in these parts for another crop of divers things before the winter season. We are daily in hopes of shipping to add to our number; for, blessed be God! here is both room and accomodation for them: the stories of our necessity being either the fear of our friends, or the scarecrows of our enemies; for the greatest hardship we have suffered hath been salt meat, which, by fowl in winter and fish in summer, together with some poultry, lamb, mutton, veal, and plenty of venison, the best part of the year, hath been made very passable. I bless God I am fully satisfied with the country and entertainment I got in it; for I find that particular content, which hath always attended me, where God in his providence hath made it my place and service to reside. You cannot imagine my station can be at present free of more than ordinary business; and, as such, I may say it is a troublesome work. But the method things are putting in will facilitate the charge, and give an easier motion to the adminstration of affairs. However, as it is some men's duty to plough, some to sow, some to water and some to reap, so it is the wisdom as well as the duty of a man to yield to the mind of providence, and cheerfully as well as carefully embrace and follow the guidance of it.